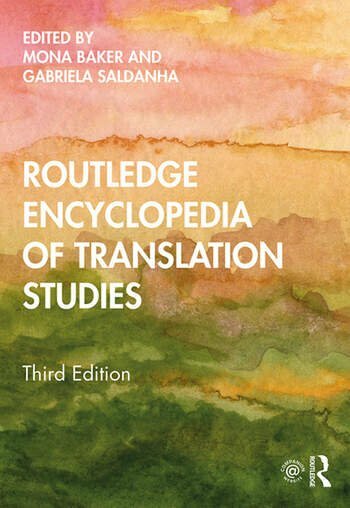 The Routledge Encyclopedia of Translation Studies remains the most authoritative reference work for students and scholars interested in engaging with the phenomenon of translation in all its modes and in relation to a wide range of theoretical and methodological traditions. This new edition provides a considerably expanded and updated revision of what appeared as part one in the first and second editions. Featuring 132 as opposed to the 75 entries in part one of the second edition, it offers authoritative, critical overviews of additional topics such as authorship, canonization, conquest, cosmopolitanism, crowdsourced translation, dubbing, fan audiovisual translation, genetic criticism, healthcare interpreting, hybridity, intersectionality, legal interpreting, media interpreting, memory, multimodality, non-professional interpreting, notetaking, orientalism, paratexts, thick translation, war and world literature. Each entry ends with a set of annotated references for further reading. Entries no longer appearing in this edition, including historical overviews that previously appeared as part two, are now available online via the Routledge Translation Studies Portal. Designed to support critical reflection, teaching and research within as well as beyond the field of translation studies, this is an invaluable resource for students and scholars of translation, interpreting, literary theory and social theory, among other disciplines. Mona Baker is Professor Emerita of Translation Studies at the University of Manchester, UK, and Director of the Baker Centre for Translation and Intercultural Studies at Jiao Tong University, Shanghai. She is author of In Other Words: A Coursebook on Translation (Routledge, third edition 2018) and Translation and Conflict: A Narrative Account (Routledge, 2006, classic edition 2018), and editor of Translating Dissent: Voices from and with the Egyptian Revolution (Routledge, 2016; winner of the Inttranews Linguists of the Year award for 2015). She posts on translation, citizen media and Palestine on her personal website, http://www.monabaker.org, and tweets at @MonaBaker11. Gabriela Saldanha is Lecturer in Translation Studies at the University of Birmingham, UK. She is co-author of Research Methodologies in Translation Studies (Routledge, 2013) and publishes regularly on translation stylistics and on the circulation of translated literature in the current publishing landscape. She is currently exploring the links between translation and art practice.